When I moved from London to NYC to join my boyfriend, I carried with me on the plane, two china tea cups and saucers I inherited from my American grandmother. Like my grandmother, I love china. Preferably second hand and mismatched. I guess that explains why I like so much to thrift china orphans. By that I mean the odd plate; tea cup; bowl; etc. My grandmother's tea cups (the beautiful black ones) now keep company with several china items I've thrifted in New York in the 2.5 years I've been here. All have cost me between 25c and $2. There is no particular thrift store that is better for them, you just need to keep your eyes peeled. Porcelain originated in China in the 9th century. It was imported to Europe for many years and even after the Europeans started making it themselves, they always referred to it as ‘china’. It is made of kaolin (a type of clay) and feldspar. China is hard, strong and translucent - allows the light through. Try placing your cup/plate against the light and waving your hand between the cup/plate and the light. If you can see the outline of your fingers – it is translucent and is real china! 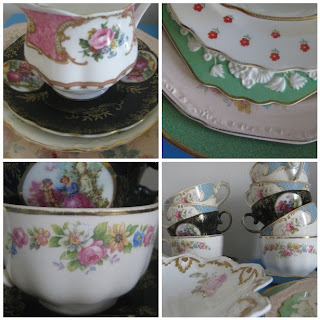 Bone China is the English form of Porcelain. It is considered as the highest quality and most expensive. It is very translucent. Although it looks and feels quite delicate, it is the strongest of china and is extremely hard and durable. Bone China actually contains animal bone ash. Hmmmm, not sure I wanted to know that. Ceramics are made out of clay, are not porcelain 'china' and are not translucent. 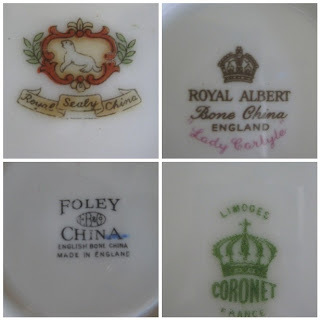 I guess that means that some of my thrift china is not china and actually ceramic. Nevermind, it is still very pretty! 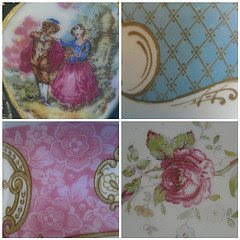 Marks at the bottom of your china allow you to trace the manufacturer and also to put a date on your item. Here are some of mine (my grandmother's is the top left one - do you know anything about it?) And that whole thing about saving your good china for a special occasion? Nonsense. I say use your good china as often as you can, after all, these things were made to be enjoyed. And what could possibly be more special than a cup of tea whilst curled up on my sofa, or dinner for two? 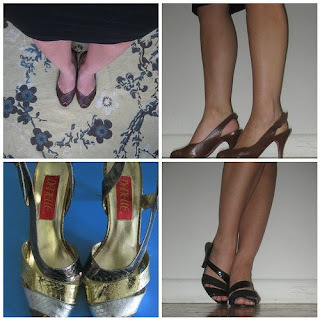 Thrifted shoes often mean that someone else has taken the trouble of breaking in the shoes for you. This means you get a gently worn pair of shoes, all soft and lovely, and you are ready to get all the gain with no pain. Thrifted shoes mean you can feed a shoe addiction without breaking the piggy bank. 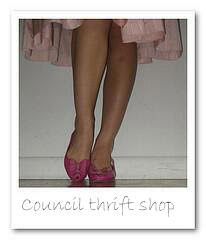 Like with all thrifting, you can look fabulous and with your own individual style. 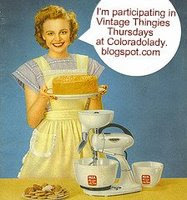 And if you're into vintage, there's nothing better than thrift. These cuties are super stylish and were found in the Housing Works Soho, for $10 - I love the ankle strap. And another pair, these are cute chocolate brown colour and a nice heel, and a lovely pink bottom. $5. This place is a treasure trove for shoes. The ones below were from the Goodwill on the UWS, they go with everything. $5. It's not rocket science. 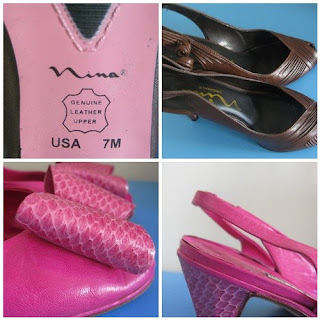 Check they are of good quality - made of leather - and in good nick - check the heels and soles. Try them on, give a twirl, see how they feel. Even in places without changing rooms, never ever buy a pair of thrifted shoes without trying them on. Be open minded. I'm a 6 and a half, but I'll try on 5 and a half, 6 and 7 - you just never know. I discovered summer soles a couple of years ago. This amazing invention is basically a trim-to-fit sole that comes in different types of materials and in stylish colours. I have them in all my shoes (thrifted and otherwise). It protects the shoes from my feet - sweaty summer tootsies - helping them last longer. And for all of you out there who may be freaked out about wearing secondhand shoes, a pretty new sole between your feet and your thrifted shoes may help you get over it. Like the saying goes: Men are like buses, you don't see one for ages and then suddenly there are two or three at the same time. With thrift shoes it is the same. After a particularly long time with no luck thrifting shoes, when you finally spot a perfect pair, you often also spot about three pairs more. 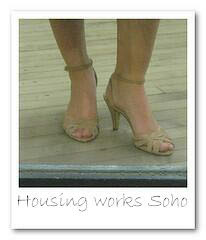 Point in case: Housing Works Soho last week had about three pairs of the most beautiful heeled sandals, all sized 5 and a half. They were all a similar style and I'm sure they were donated by the same woman. Unfortunately they were all too small for me but nevermind, I'll cash in my thrift karma another day. Like all thrifting your efforts will be rewarded over time - don't expect success every time, that's the fun part. Go forth and thrift my friends! Good luck and thrift karma! My friends Rob and Pippa got married two weekends ago in Norfolk, England. It was the perfect English summer wedding. This is the room they got married in, in a gorgeous old country Manor, the sunlight flooding in. I cried, I couldn't help it, I always cry at weddings! I wore a dress I thrifted last year from a thrift store in the East Village, NYC, for a grand $15. The dusk pink handbag is also thrifted, from the British Heart Foundation Charity shop in Somerset, England. After dancing the night away, the next day, my boyfriend and I went on a walk from our little village of Cley-upon-sea. We came upon a 'cockle van' next to the sea port where all the sail boats were anchored. Our lunch will go down as one of my all time memorable meals. Deliciously simple seafood, oysters, the smell and taste of sea and perfect company.